These candles stand out in their simplicity. Hand-painted in Lithuania, the holiday patterns add a touch of festive to your space. 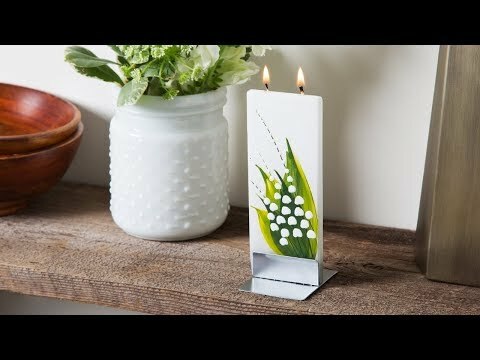 The flatter design is a unique approach to candles that has a minimal (and eye-catching) feel. The twin wicks burn evenly and self-extinguish as they near the steel base, without any dripping wax or smoke. My sister loved them and refuses to burn them. Bought 8 of these so far. Gave most as gifts, but kept several for myself. 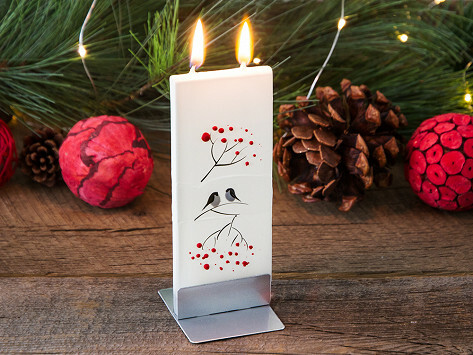 Hand-painted in Lithuania, Flatyz candles stand out in their minimalism. Unlike other candles, these are unconventionally flat. This gives them a clean, modern look that is complimented by a sleek steel base and snuffer. The candles not only look clean, they burn cleaner, too. The twin wicks burn evenly and self-extinguish as they near the base, so there’s no dripping wax or smoke. Whether you’re setting the scene for a holiday or adding a decorative touch to your space, the handmade candles are an eye-catching new way to get that festive glow.